The Harbour CBD includes the areas of Sydney CBD, North Sydney CBD, Barangaroo, Darling Harbour, Pyrmont, The Bays Precinct, Camperdown-Ultimo health and education precinct, Redfern to Eveleigh, part of Surry Hills and Sydney East. the headquarters of 15 of the top 20 global investment banks, 18 of which have an Australian presence. The implications of a strong financial services sector include high demand for premium-grade office space and high demand for associated knowledgeintensive industries such as legal, accounting, real estate and insurance. Therefore it is critical that planning controls enable the growth needs of the financial and professional sector. The strength of the Harbour CBD is reinforced by the Eastern Economic Corridor (refer to Objective 15). high amenity, high density residential precincts. Greater Sydney is Australia’s gateway for 30 million visitors a year25 who are drawn to internationally renowned attractions such as the Sydney Opera House and the Sydney Harbour Bridge, arts and cultural events. Destination NSW leads the delivery of tourism and events to support Greater Sydney’s visitor economy. Innovation underpins global 21st century cities. Along the western edge of the Harbour CBD an Innovation Corridor is emerging (refer to Figure 32). 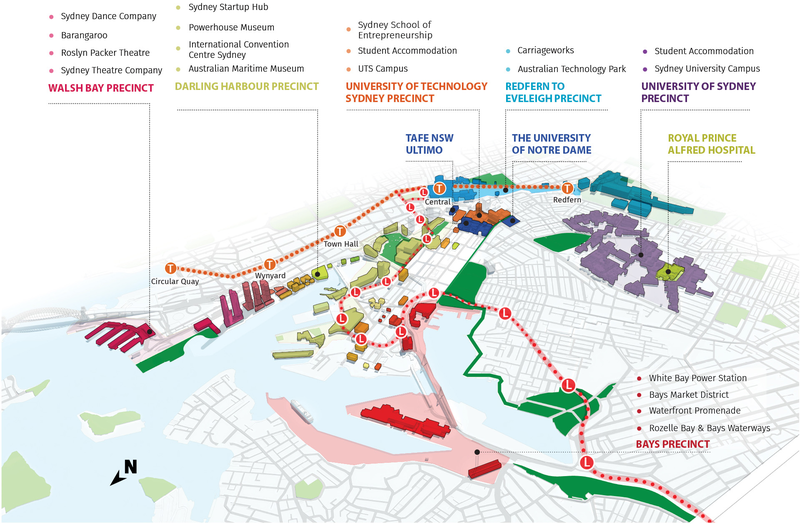 It extends from The Bays Precinct, to high-tech and start-up hubs in Pyrmont and Ultimo, to the health and education institutions of the University of Technology Sydney, University of Notre Dame, University of Sydney, Royal Prince Alfred Hospital, and on to the Australian Technology Park. 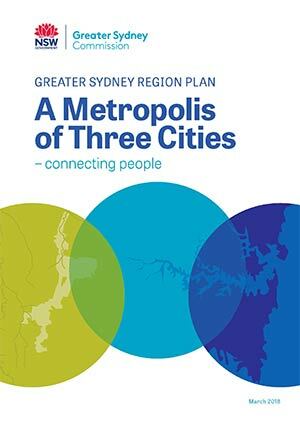 Facilitating the attraction and development of innovation activities enhances Greater Sydney’s global competitiveness. Planning controls need to be flexible to allow for the needs of the innovation economy. The Harbour CBD is becoming a more attractive place to live, in line with worldwide trends which are seeing global city centres being as much about living as they are about jobs. A 24/7 economy and a nighttime economy would support both outcomes. These require careful consideration and management of activities in the context of noise, safety and other amenity issues. Building heights in the Harbour CBD are constrained by the safety requirements for the management of flight paths for Sydney Airport26. The protection of the amenity of public spaces from overshadowing is also important. With identified future office supply limited to around 10 years there is a need to maximise vertical development opportunities and outward extensions where possible, for example southward along the Redfern to Eveleigh corridor. Facilitating office development can be complex, especially as residential development also competes with commercial development for scarce Harbour CBD space. Maintaining a long-term supply of office space is critical to maintaining Greater Sydney’s global economic role, and should not be compromised by residential development. The Harbour CBD is well served by a longestablished public transport network with radial connections to most parts of Greater Sydney. Committed public transport infrastructure such as Sydney Metro Northwest, Sydney Metro City & Southwest, the CBD and South East Light Rail and the Northern Beaches B-Line bus will significantly increase and improve accessibility to and from the Harbour CBD. Planning is also underway for the delivery of the Western Harbour Tunnel and Beaches Link which will further improve accessibility from the Northern Beaches to the Harbour CBD and reduce through traffic in the Harbour CBD. Improving walking and cycling links will enhance amenity and attract more businesses to the Harbour CBD. Walking and cycling connections are particularly important for the Innovation Corridor, where pedestrian connections can spur an exchange of ideas. infrastructure investments, particularly those focused on access to the transport network, which enhance cycling connectivity within 5 kilometres of strategic centres or 10 kilometres of the Harbour CBD. providing a diverse and vibrant night-time economy, in a way that responds to potential negative impacts. The Greater Sydney Commission to lead private, government and education sector stakeholders in the ongoing planning of the Camperdown-Ultimo Collaboration Area through the preparation of a Place Strategy. This multi-stakeholder approach will support and leverage existing infrastructure to improve urban amenity to grow jobs and business opportunities. Sydney Opera House and Sydney Harbour Bridge from the north east.